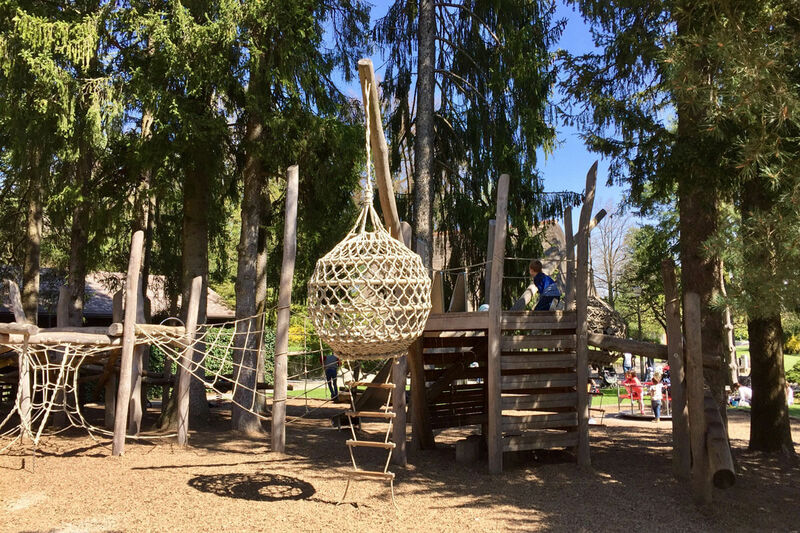 We have personally road tested some of the outdoor entertainment options and found these to be the coolest playgrounds in Zürich. Artergut is a gem of a playground. When you do not feel like going to a busy public bath (Badi) but want to allow your offspring a refreshing bath, this is the place to go. The shallow water play area is a popular spot – both for squealing children and their gazillion of floating toys. 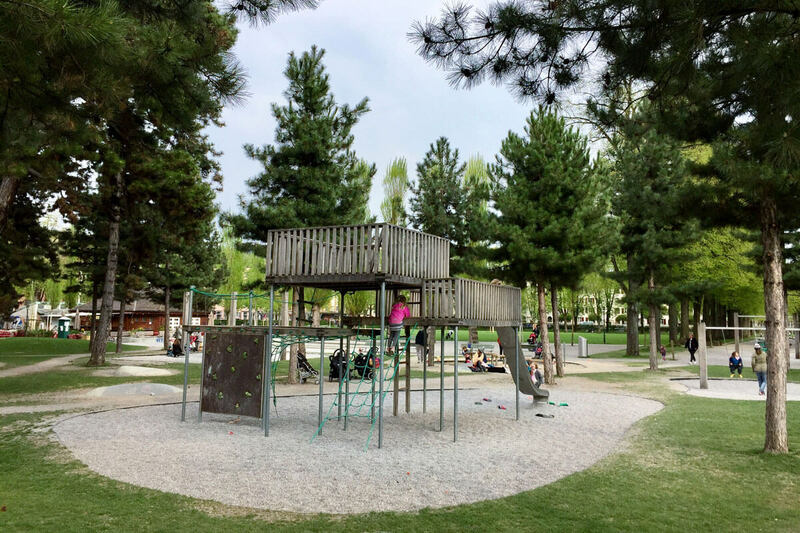 Hidden behind the busy Kreuzplatz, the Artergut park offers a shaded sandpit, wooden climbing play area, slides, swings, a table tennis surface and a large grassy area to play soccer, run wild or have a relaxing picnic. And in winter, there is a small sledding hill. It is nothing too crazy - just about right for any mother's heart to not stop completely! Amenities: Public toilets and baby changing facilities. Nearest tram stops: Kreuzplatz or Englischviertelstrasse. Fast, faster, fastest: The three slides come in all different shapes and sizes, catering to children of all ages, abilities and levels of cheekiness. Little adventurers have extra fun exploring the suspended rope bridge, the flying fox, bike park and rock climbing wall. For those who prefer to run behind a ball or a frisbee, there is enough space to do so in the grassy park. The community center is home to donkeys, lamas, goats and ponies. Eager animal lovers can help feed the animals in the mornings or participate in the pony-back riding fun (every Saturday from March to November from 3:30 to 4:30 PM, 4 francs per person). After all these physical activities, you also have the option of either stopping for a picnic or grabbing a little something from the community café. Amenities: Public toilets and baby changing facilities, community café. The vibrant Josefwiese park attracts families with kids, boule playing pensioners and laid-back hipsters alike. Children can dig and sift through the sand, climb the playhouse, play soccer in the large park or splash around in the knee-high dancing water fountains. Meanwhile, the grownups can enjoy a cold drink at the kiosk or BBQ some Cervelats at the public barbecue facilities. But be quick, the barbecue station is prime real estate in summer and there may be a queue for it! Afterwards, you can let your kids scoot or ride along the Viaduct arches. This is a good walking mile for some (window) shopping among various boutiques or for buying fresh food from the farmers’ market at Markthalle. Amenities: Public toilets and baby changing facilities, kiosk restaurant. "My kids just love to share their toys," said no parent ever. Well, it is a good thing that at this playground, there are plenty of sand toys, bobby cars and other cool play equipment available for everyone to have fun with. Not only this, but the wooden climbing poles with ropes and nets provide little daredevils loads of entertainment. A nice café and a full range of courses for children, adults and families complement the offering of this community center. 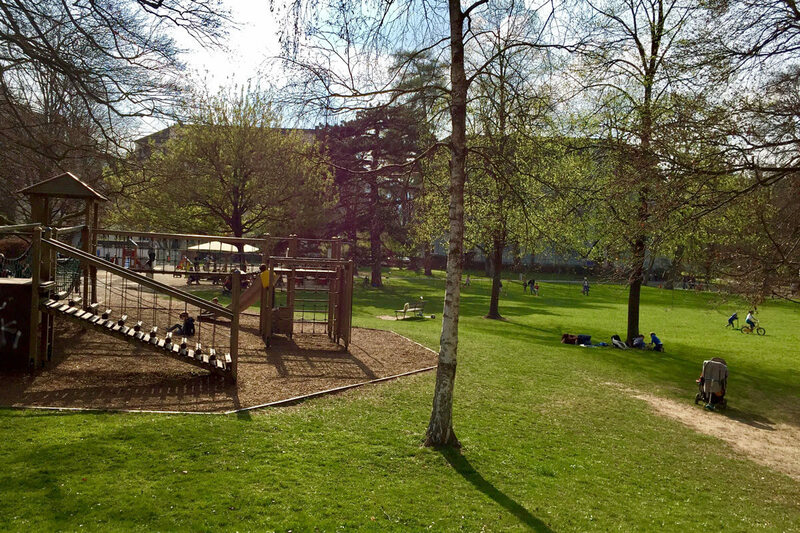 Parents will also enjoy the neighboring gardens of Museum Rietberg. Nearest tram stop: Museum Rietberg. 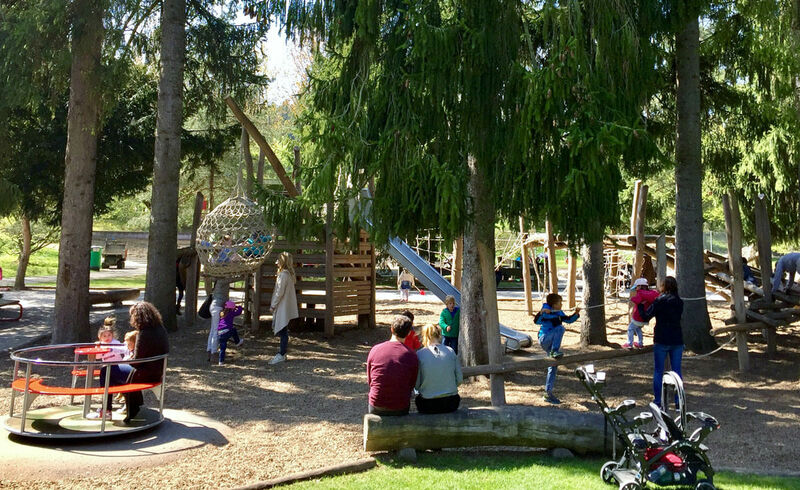 With unprecedented views of the city and the lake, the Sonnenberg playground is certainly a parent pleaser. That’s if you are lucky enough to sit down and take in the beautiful surroundings. Compared to other playgrounds, it may be small in size. However, this well-tended Spielplatz with sandpit, wooden play equipment, a slide and swings will keep the kids busy for a while. And a quaint fountain adds some extra (splashing) fun for hot summer days. 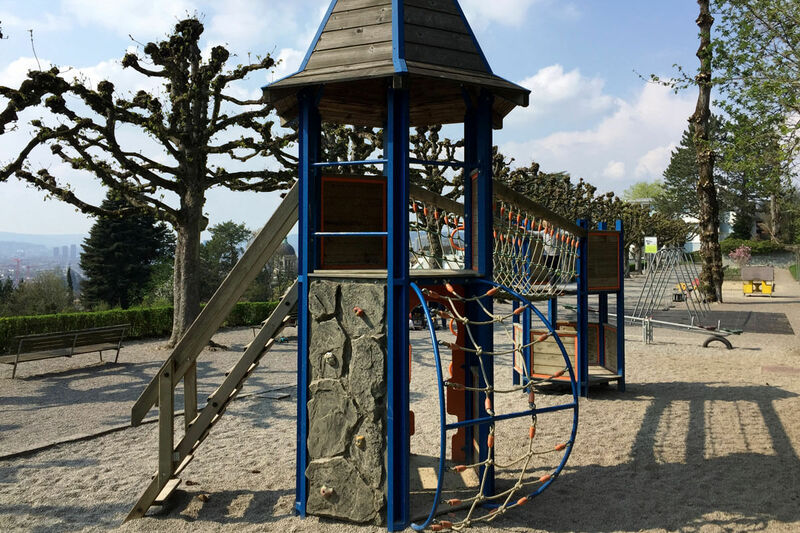 Since Sonnenberg is nestled on a hill in the most prestigious neighborhood in Zürich, you can make the trip to the playground a small adventure. 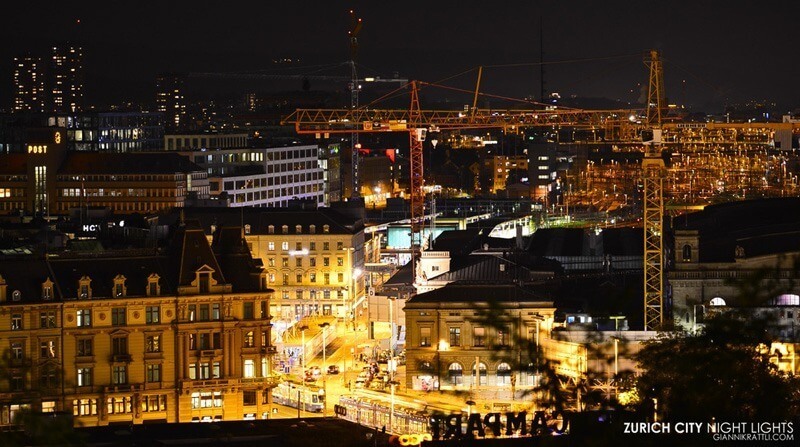 Take the Dolderbahn cogwheel railway and browse around Zürichberg’s steep little streets lined with lavish mansions. Boasting wooden climbing frames with ropes and nets, a water playing area and a small pet farm, this Gemeinschaftszentrum (community center) is a very popular spot for locals. It is well loved by children of all ages. One of the most visited workshops is the weekly “Open Stable” where kids learn about the resident animals and how to use a wheelbarrow to clean the stables (cost: 4 francs per person). What a sight to see all these keen little helpers at work! 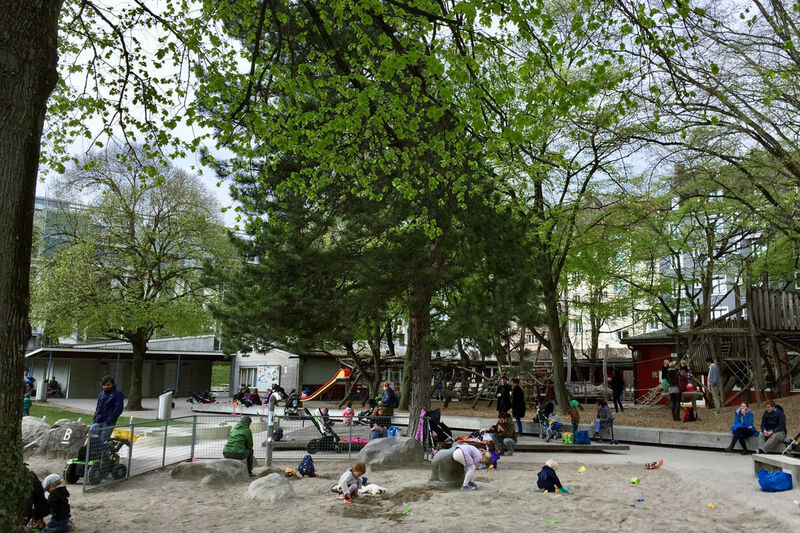 Located next to the River Limmat, it is also a nice place to just hang out on the grassy park, try the delicious cakes from the bistro or take in the urban-chic vibe of Zürich Wipkingen. Amenities: Public toilets and baby changing facilities, bistro. Nearest tram stops: Föhrlibuckstrasse or Wipkingerplatz. Hey parents: If you feel like leaving this little big city for an afternoon, head down the left side of the lake to Rüschlikon. 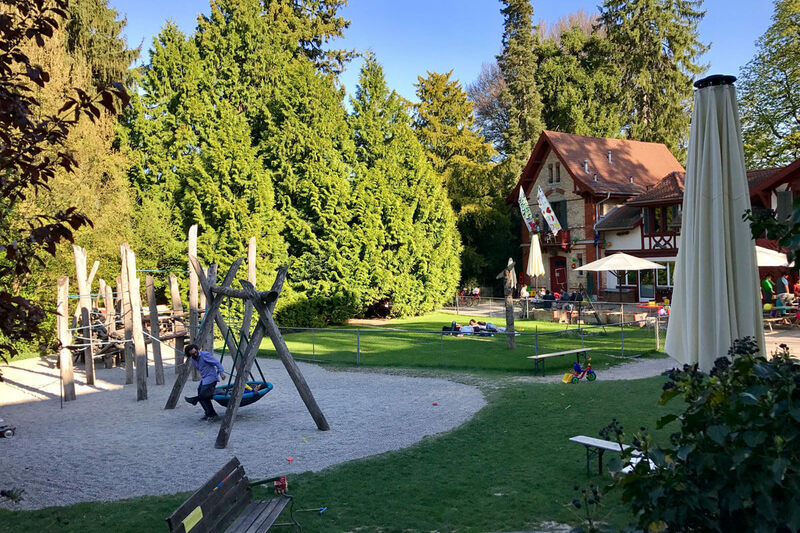 There, you will find the cool playground “Park im Grüene”, complete with climbing frames, a water play area, a puppet theater and mini train rides. 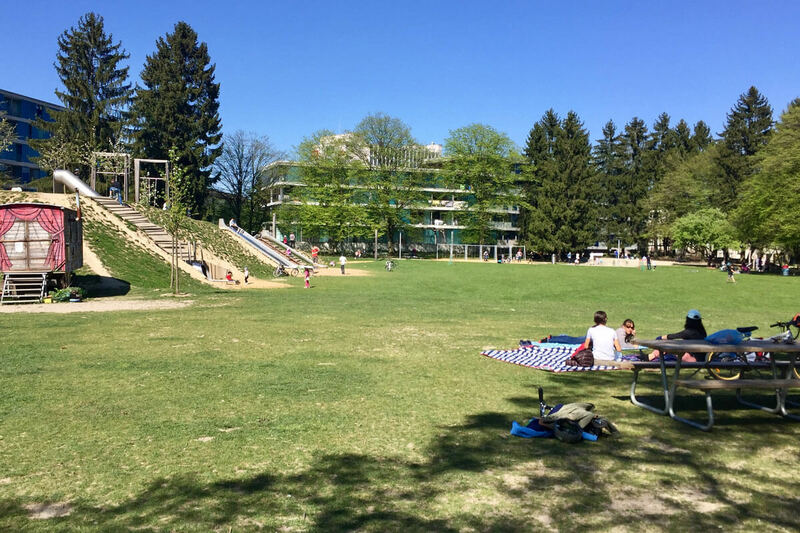 Operated by the Migros cultural foundation, this park takes in a prime lot by the lake. Parents will love the free barbecues facilities, the stunning vistas and the easy-access toilets. Park im Grüene is really worth a visit! Amenities: Public toilets and baby changing facilities, Migros self-service restaurant with indoor playground. Nearest bus stop: Rüschlikon, Park im Grüene (take bus 165 from Zürich Bürkliplatz).